Within a half mile of each other in north Nottingham, are three areas of wonderful beauty and interest. Yes, I'm on my travels again visiting some places I've been to before, but seeing features I'd not previously seen or commented upon. When you enter the Nottingham Arboretum by the Waverley Street entrance, you cannot fail to see this monument to Samuel Morley. The inscription describes him as MP, merchant, philanthropist, friend of children, social reformer and christian citizen. Why is he so remembered in Nottingham? Samuel was born in London in 1809, to a Father who founded the family's knitting business with warehouses and distribution bases in London. The firm of I & R Morley became a significant player in the knitting industry, being responsible by 1844 for 6% of the industry's output. Samuel is certainly not remembered in Nottingham for his time as the city's MP, for though he was elected in 1865, winning a narrow and acrimonious victory over Sir Robert Juckes-Clifton, the election was declared void the following year. He served as MP for less than a year, and there is no record in Hansard of any contribution, let alone a contribution to Nottingham. In 1868, he would become MP for Bristol and remain so for the next 17 years. It was as a merchant and social reformer that I'm sure he will be best remembered. Samuel took over the firm's Nottingham operations in 1855, and the whole company in 1860. He opened new sites on Manvers Street and Handel Street in Nottingham, and showed himself to be very supportive of the working man. He founded the Warehousemen and Clerks' Association to provide friendly society benefits and health insurance for the firm's staff. The early 1800's were a difficult time for framework knitters, as mechanisation was driving them out of work, but in 1865 Morley's still employed 50,000 framework knitters. They retrained knitters to bring them into factories, and paid older knitters small pensions. Morley's grew to become one of the largest companies of its kind in the world. He was also a strong abolitionist, who worked hard for the end of slavery. He created endowments for colleges and churches, and was a strong Dissenter (Congregationalist). A contemporary biographer said that he would be remembered by posterity as, "one of the leading merchant princes and philanthropists of the century". I think that he deserves to be remembered in Nottingham. 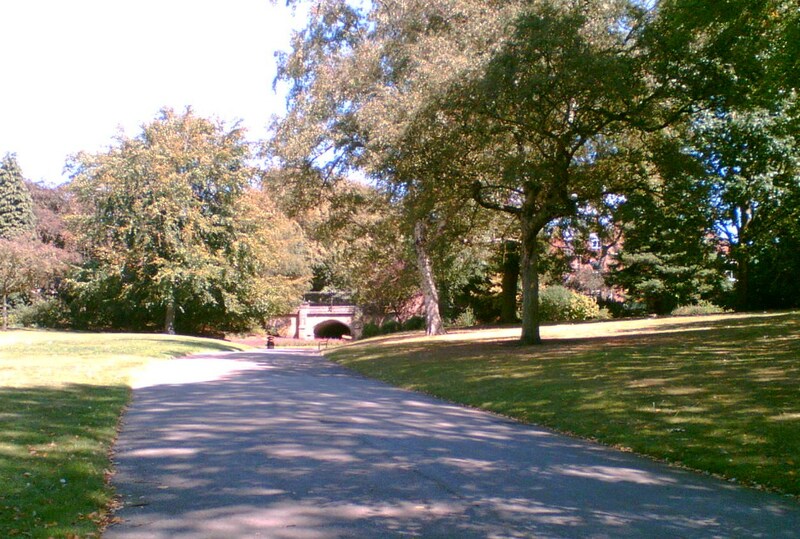 Leaving Samuel Morley's monument, and passing the ice cream van - yes passing it without buying - I decide to leave the Arboretum by the Addison Street entrance and make my way to the Church (Rock) Cemetery, which I have commented upon before. There was an area of the cemetery, that though I'd previously looked down upon it from above, I had never actually taken a closer look. 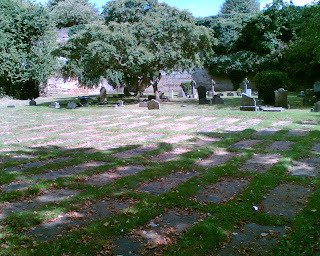 The area is called St Ann's Valley, which is accessed by a sloping path on the Forest side of the cemetery. There is another access through a tunnel from another part of the graveyard, but this is now closed off by locked gates. In the late 1800's the valley was created by moving loads of sand and filling up other areas. Catacombs were created, some of which can be seen today. It really is a beautiful spot. As can be seen from the photograph, about half of the area is laid out with large, flat slate slabs. Each one has many names recorded on them, with dates for different years. 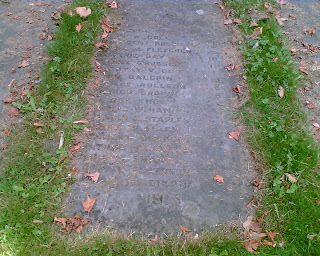 What fascinated me were the number of slate slabs with children's names and ages on them. The one in the picture opposite had a list of 30 children's names, with ages ranging from 2 days, to 10 years old, with the year 1913 at the bottom. To be honest, I'm a bit unclear as to what this is all about. Some say that these are paupers mass graves, but I've always thought that paupers graves were not marked by names. Others say they are the mass graves of children who died in an epidemic, but I haven't been able to find a record of a major epidemic in Nottingham around 1913. Still others speculate that in years gone by you could, at the cost of one guinea pay for a name to be placed on a gravestone, and that perhaps some benefactor contributed to the cost, which would have been considerable, as there are hundreds of names. I confess to being intrigued by this very emotional place, and would like to explore the origins of the graves when I get some time. If any of you know the answer, then do please let me know, as I have acquired an insatiable appetite for information. I think it's a good job that I live on my own, or I would drive anyone else in the house quite mad. Leaving the Rock Cemetery I decide to make my way back to the Arboretum to listen to the second half of the Brass Band concert. I turn in to Arboretum Street which I had not been down before, and imagine my delight when I come across this magnificent building in the picture. Being a lover of ancient buildings, it took my breath away. What was it? I was so captivated by its beauty that I hadn't noticed the sign declaring it to be Nottingham High School. 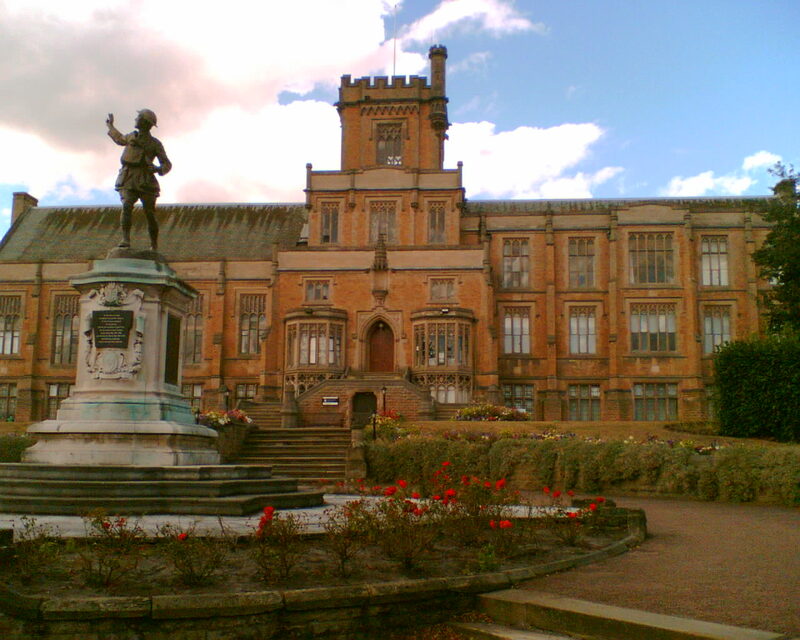 It was founded as a "free school" by Dame Agnes Mellers in 1513. Free meant that some benefactor would contribute to the cost of schooling. It's unclear whether this was a new institution or a refoundation or endowment of an existing school, as records exist of one as far back as 1289. It is now a boy's independent school with around 900 pupils, aged between 11 and 18. 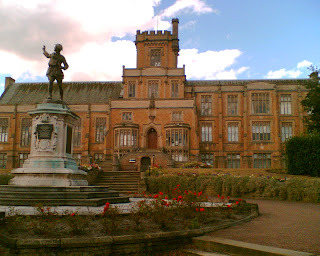 There is also a Nottingham High Junior School, and the Lovell House Infants School, so that now boys can be educated at Nottingham High from ages 4 to 18. All former members of staff and pupils are known as Old Nottinghamians, and are entitled to use the letters ON - for what purpose I have no idea. Given the nature of the school, it will come as no surprise to learn of the illustrious careers of many. In Arts and Broadcasting: Kenneth Adam - BBC Controller. Michael Bywater - writer and broadcaster. Jonathan Charles - BBC Foreign Correspondent. Leslie Crowther - comedian and quiz show host. Christopher Hopwood - classical musician and conductor. D.H. Lawrence - writer. Nicholas McGegan - classical musician and conductor. In Academia: The Very Reverend Dr Eric Abbott, KCVO - Warden of Keble College, Oxford, and Dean of Westminster. Dr Robert Macfarlane - fellow of Emmanuel College, Cambridge. Professor Frank Nabarro FRS - solid-state physicist. In Politics: Ed Balls MP. Kenneth Clarke QC MP. Edward Davey MP. Geoff Hoon MP. In Commerce: Jesse Boot - founder of Boots the Chemist. John Player - tobacconist (John Player & Sons). In Science and Technology: J.P. Knight - inventor of the traffic light. So another interesting day in Nottingham, and by the way, the Brass Band were very good. Hey there. I find your blog about Driving Lessons Nottingham by way of Google while searching for a related topic, your blog came up. It looks great. Thanks for share.